Amore is the Italian word for love. 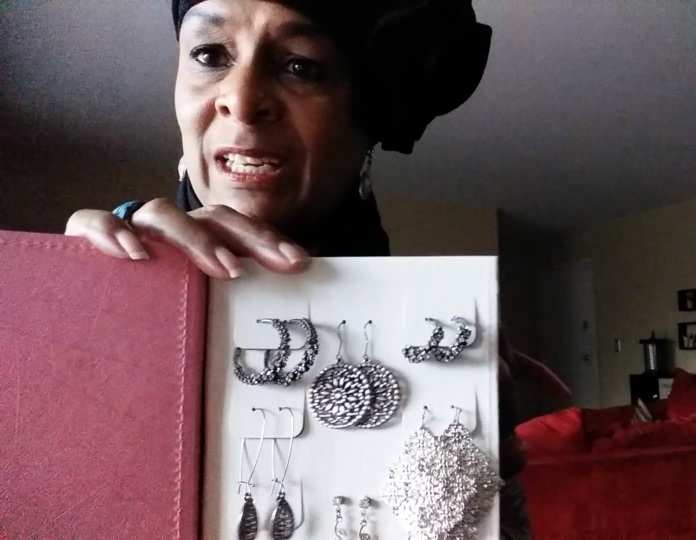 Amore is also the online shop where I snagged this fabulous earring storage album that I talk about in the video. Before I go any further, I am not being compensated for this review which is purely my personal opinion. It took a couple of weeks for my package to arrive. Unfortunately, I already shredded the address label and can’t remember where it was shipped from. While there are legitimate companies who use Gmail accounts, typically I prefer an email address that matches the domain of the business. When I received my confirmation it was a Gmail address via Shopify. I ordered a red storage album and as you can see, received a pink one. While I could have sent the pink one back it was not a dealbreaker for me, so I kept it. Since the benefits of easy storage outweighed the risks this was a perfect option for me. The photo is a frame from the video where I’m sitting at my dining table demonstrating the album. I’m wearing a black headwrap with gold threads and a decorative flower is over my left ear. With my black/gray v-neck sweater I have a black oblong scarf with gold threads tied around my neck.